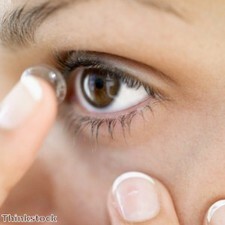 Daily contact lenses "must be disposed of"
People who wear daily disposable contact lenses have been advised not to be tempted to wear the products for longer than the manufacturer's recommended wear time. Some people who wear dailies make the mistake of not following the instructions set out by their contact lens manufacturer and wearing them for longer than 24 hours – even a few days, in some cases, noted Dr Shahzad Mian, a cornea specialist at the University of Michigan's Kellogg Eye Center. "We'll have patients come in who will admit having used the same lens for three months in a row, without even taking it out once," the expert told Click on Detroit. He added that there is a good reason why manufacturers put recommended wear times on the lenses, as a great deal of research has gone into it. "The lens material is designed such that it is good for a certain period of time and there's limited risk with respect to infection and injury to the surface to the eye," Dr Mian explained. It comes after a recent survey carried out by the US organisation LasikPlus found that, of the millions of people around the world who wear contacts, many have reused contact lens solution or worn the lenses beyond the manufacturer's recommended time limit.